If you are thinking of buying a new seat and seat mounting system for your new Indian Scout we can help. This seat mounting kit is made in the USA with 1/4” US made cold rolled Steel. The seat mounting kit is Powder Coated. The mounting kit comes with everything you need to mount the kit, including the four bolts to mount the kit to the frame and the rear kit cover. 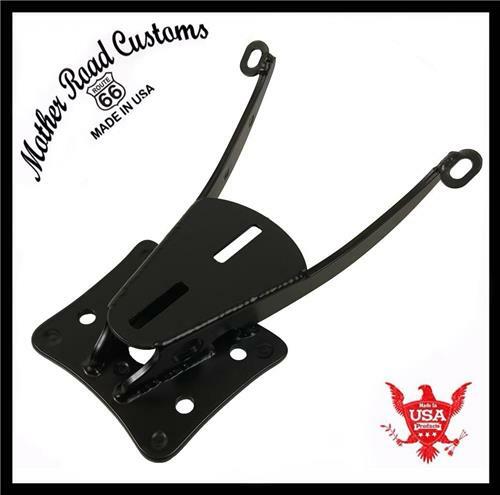 After you purchase our Indian Scout, Bobber rigid seat mounting kit you will need a seat. Seat is Sold Separately in this listing. Any of our 15"x14" Tractor seats will fit this rigid seat mounting kit. The 15x14" Tractor seats fit our rigid seat mounting kit the best but our smaller and medium seats like the 10x13, 12x13” seats and 13x15" seats will also fit right on this kit but they will mount only on 3 of the 4 mounting points on the kit. One of the two front bolts will not be mountable. The sitting position on our rigid Indian Scout seat mounting kit has a very neutral riding position and provides the most comfortable riding position. The sitting position is essentially the same height as the stock seat but since our solo seats are narrower in the front it gives shorter riders more reach than stock. We love how the mounting kit looks on the Scout and the ride is fantastic with this kit. Again the 15x14" tractor seats are the best choice for this kit but our smaller seats will also fit this mounting kit. Customs Where Quality Comes First.